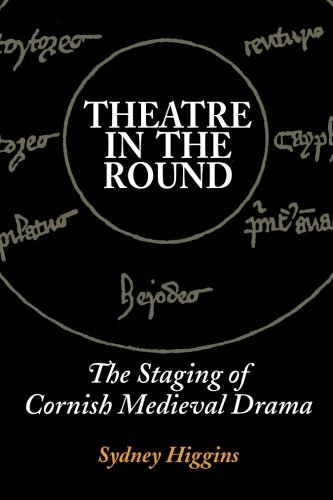 Review of Sydney Higgins new book, ‘Theatre in the Round — The Staging of Cornish Medieval Drama’, (Charleston: Alldrama, 2013) 192 pp. Over a quarter of a century ago, Charles Thomas, then Director of the Institute of Cornish Studies, took Myrna Combellack and me across the fields to what he considered very likely to be ‘Carrek Veryasek’, ‘Meriasek’s Rock’, in the Cornish play on the life of that saint. It was an impressive place: a great rock outcrop now known as Reens Rock in Camborne parish, not unlike features in the Sydney area, which would be good for the sport of ‘bouldering’. My mention of it is not to reproach this eminently worthwhile book on a topic that badly needed to be treated for not referring to a feature that probably few living people have seen. The absence of references in text or bibliography to the extensive treatment of the Meriasek localities in Charles Thomas’ Christian Antiquities of Camborne, which has all the advantages of a study written by a local boy who became a professor, is regrettable, however. As well as for the Rock, this would have been useful for the pratum (= Town Meadow), chapel of St Mary in Camborne churchyard and St Meriasek’s well of which the approximate site in Tehidy Road is known; it also makes quite a good, if cautious, case for the existence of a plen an gwary, outdoor amphitheatre at which plays were performed, at a site which came to be occupied by the Milk Marketing Board at Camborne. Exactly what went on at such playing places is the subject of this book. How great to see the wealth of evidence about the performances of Cornish medieval drama analysed by someone with academic and practical experience! As I’ve said in teaching — admittedly with some exaggeration — we know everything except where the audience was, and about this the author of the book makes a strong, if not watertight, argument, on which more anon. The manuscripts contain plans of the round stage for the three days of the Ordinalia and two days of Beunans Meriasek, abundant stage directions which can be correlated with them, and there is at least one surviving plen an gwary at St Just in Penwith. Ah, but what of Piran Round, you may ask? It is hard to share the author’s doubts that it was a playing place and conclude that the eighteenth-century antiquarian William Borlase had no sound basis for his identification of the round as such and naming the feature within it the ‘Devil’s Spoon’. Nevertheless, some support is provided by the existence of a clearly labelled plen an gwary on an old map which I saw when researching St Piran’s Oratory as an early monastic site: as I recall this was on the eastern border of Perranzabuloe parish and I remember thinking that it was surprisingly close to Piran Round; no problem if the latter wasn’t a playing place after all. But I want to return to the Rock. For the author this came on wheels, changing locality, identity and function, ‘a very useful piece of scenery!’ He doesn’t say whether for the inevitable spring miracle it came equipped with the equivalent to the hose coupling that enlivened our production of the Cornish scenes from Beunans Meriasek but leaves no doubt that the scenery for the Cornish plays could be very elaborate. I read the explanation of the lines ‘The rock/stone has bent down / On the shore to receive you’ as facilitating embarkation from a ship with great interest, because on one occasion I was that rock, standing under a bespattered grey painters’ cloth which I fondly thought would be seen as lichen on granite and bending at the waist just before these lines; in other words, mistaking it to be a menhir. I am happy to stand corrected by the couple of parallels from English medieval drama that he cites. The book is to be praised for settling the production of the Cornish plays in the wider context of European (not just English!) medieval drama, as Brian Murdoch does their texts in Cornish Literature, a fine book which I have also reviewed. The main source analysed in the book is Beunans Meriasek. How wonderful to see this play about a local Cornish (and Breton) saint given the attention it so richly deserves! Performance on each of the two days is plotted in detail, the number of lines spoken by the characters tabulated and suggestion made about the minimum number of actors required. It is unfortunate that Myrna Combellack’s edition of the play does not appear in the bibliography; true, it is an unpublished Ph.D. thesis but obtainable on application to the University of Exeter and there is a copy on my shelves. Nor does her translation, published as The Camborne Play, which is the one I choose to use for performance, but preferences may differ on this of course. When the analysis moves on to the later Creation play Gwyrans an Bys (the language of which has Late Cornish features which tend not to be mentioned) the results are interesting but insecure. There is no surviving stage plan for this play; moreover, its stage directions as cited in the book leave room for doubt as to whether it was performed in the round which its modern editor Paula Neuss shared. While there is no surviving stage plan for the recently discovered saint’s play Beunans Ke either, it merited much more than the token recognition it gets in the book, comprising as it does two huge chunks of text which were available in Cornish and English translation on the internet for years before the edition cited in the bibliography was published. Now, where was the audience of the Cornish theatre in the round? It was great to see the last chapter devoted to answering this question, cogently arguing that they stood, in effect, in the platea, the plain, the plen of plen an gwary. (This is properly defined as the flat central area within the surrounding bank; the narrower definition of it proposed in the book is convoluted and unnecessary.) The author demonstrates how the action shifts from segment to segment of the round as the play progresses, and suggests how the audience could have been guided to new positions. My problem is that the illustration of a Continental mystery play (figure 10: La martyre de Saint-Apolline by Jean Fouquet), also remarkable for showing an Ordinary and/or Conveyor directing proceedings, cited in support of the audience ‘on the flat central area that is in front of and below the scaffolds’ not only does not clearly show this in black-and-white but when viewed in colour on the internet seems to show them sitting on tiers below the scaffolds, the opposite of what is being argued here. The textual evidence for a mobile audience cited from the Digby play The Conversion of St Paul is effective, however. h. Distribution – through CreateSpace to Amazon, major online & offline bookshops & retailers, public & academic libraries and book resellers. The important and rich collection of medieval plays from Cornwall has, in the past, been all but ignored by the majority of drama historians and critics. In this book, Sydney Higgins shows why this is a mistaken and ill-informed view. The oldest of the three surviving manuscripts is the Cornish Cycle – performed on three consecutive days – that is probably the earliest surviving British drama script. Next is ‘Buenans Meriasek’ (‘The Life of St. Meriasek’) that is the only full-length medieval saint’s play to have survived in the literature of Great Britain. The last of the three, ‘The Creation of the World’ is the first day of another Biblical play. In the manuscript of the Cornish Cycle, there is a plan of the theatre for each of the three days and there are two similar ones in ‘St. Meriasek’. Apart from these five, the only other other plan of a British medieval theatre that has survived is of ‘The Castle of Perseverance’. Like those for the Cornish plays, it is circular. 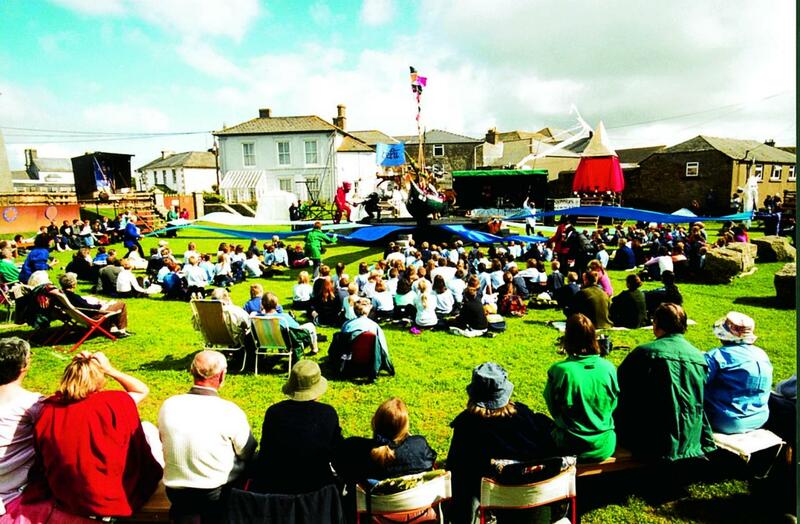 Among the many important conclusions in the detailed and meticulously researched examination of the staging of the Cornish plays is that the medieval circular theatres are far more likely to have been the inspiration for the circular theatres of Shakespeare’s age than the highly unlikely notion that their origin arose from a pageant waggon being parked in a rectangular inn yard. Sydney Higgins was the founder and organizer of the four International European Medieval Drama conferences and festivals that took place in Camerino, Italy, from 1996-1999. He was the editor of the first three volumes of ‘European Medieval Drama’ published by Brepols. Since 1992, he has taught at the University of Camerino. He is also the founder and director of the theatre company, The Camerino Players, that has presented a wide range of productions including musicals (e.g. ‘Cabaret’ and the first ever Italian version of ‘Sweet Charity’), drama (e.g. ‘The Crucible’ and ‘Krapp’s Last Tape’ – in both English and Italian), medieval drama (e.g. the Wakefield/Towneley Cycle) and plays specially written for children (e.g. ‘The Clown’ and ‘Let It Be You’). He has also written the story and libretto of several musicals. For the contribution this made to the cultural life of the city, he was made the Camerino Citizen of the Year for 1999. For all his professional life, he has been involved in the theatre. He has been a teacher of drama, opened a new theatre in Uganda and, prior to moving to Italy, was the Senior Adviser for English and Drama in Suffolk. Both he and his wife are also successful writers. His many publications include the biographies ‘Rider Haggard: The Great Storyteller’ and ‘The Benn Inheritance: The Story of a Radical Family’. His educational books include the best-selling series ‘Aspects of English’. He has also ghosted many books, including ‘Stroll On’ for Tony Booth, ‘Piper Alpha: A Survivor’s Story’ for Ed Punchard, ‘Nicola: A Second Chance to Live’ for Nicola Owen, and the ‘Pirelli Album of Motor Racing Heroes’ for John Surtees. He and his wife, Antoinette, have also written many textbooks and also two guidebooks entitled ‘Staying in the Châteaux Hotels of Eastern and Western France’. His special interest, however, has always been medieval drama and he started and maintains the Internet sites, ‘Medieval Drama Links’ and the ‘Bibliography of Cornish Medieval Drama’.